As an upper level low begins to move eastward, the strong core of the mid and upper level winds will rotate around the upper low. An increasingly favorable kinematic environment for supercells and potentially strong tornadoes will develop from Central Illinois/Central Indiana through Southern Missouri into Eastern/Central Oklahoma and Northern/Western Arkansas. The area at greatest risk for strong tornadoes is from Central/Eastern Oklahoma through Southern Missouri into Central Illinois. Although there will likely be AM storms, some severe, the storms that will develop Friday afternoon and move into Ohio-Valley during the overnight hours are the ones that pose the greatest risk for that area. Boundaries from earlier convection in the day will likely focus localized helicities values over 400 m^2^s which will enhance the tornado potential with storms that develop in non-linear modes. Bulk Richardson Shear values favor supercell storm modes across these areas, at least initially. Other storms will likely form further south across Oklahoma where the instability will become extreme with surface capes over 5000 and shear values in excess of 40kts. CIN will drop below 25 j/kg by afternoon and supercells should form with the aid of an approaching shortwave. With LCL’s AOB 1000 meters, tornadoes are quite likely, especially across Northeastern OK. The Maximum Updraft Helicity product from the 4km WRF/ARW has been consistently generating strong supercells across OK, MO, IL Friday Afternoon & Evening. 1 Hour Max Updraft Helicity. 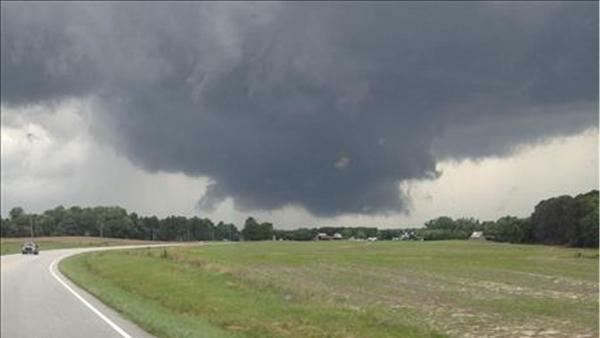 Indicate Rotating storms develop late. High Surface Dewpoints work northward into IL/IN feeding storms. Surface CAPE is quite high. Surface Low over MN and Secondary Low over SW OK will help back Low Level Winds. Supercell Composite Parameter indicates likelihood of rotating storms from OK northeastward into IL. 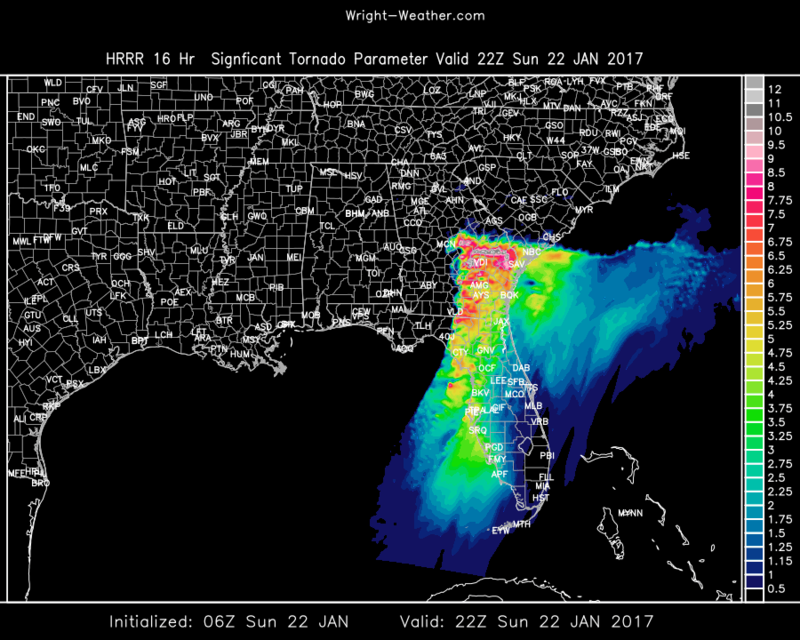 Significant Tornado Parameter indicates risk of strong tornadoes. GFS Forecast Sounding for Springfield, IL for 00Z. Again kinematics and thermodynamics supportive of supercells and tornadoes. 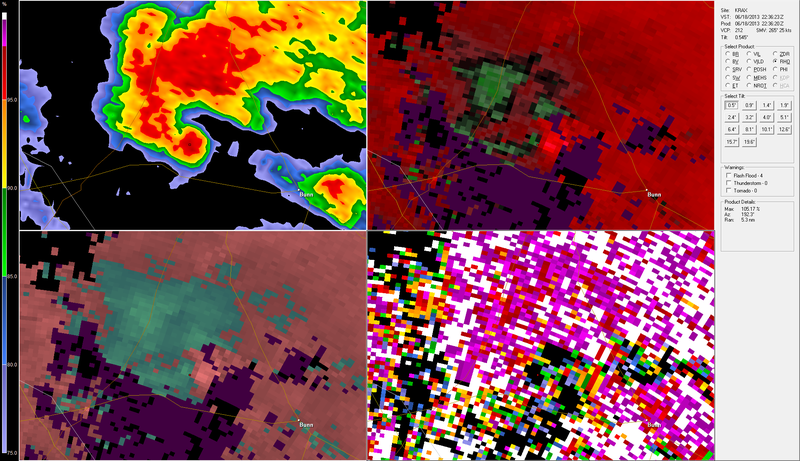 Remarkable radar data from the El Reno EF5 Tornado. The May 31st EF5 El Reno Tornado that killed several storm researchers was sampled by ground based mobile X-band doppler radar (RaxPol) with very high resolution and found extreme wind speeds of almost 300 mph and rare satellite tornadoes. 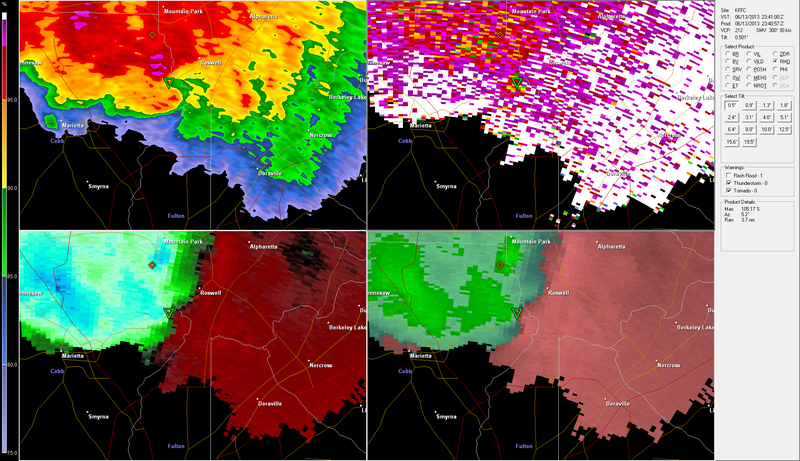 Other conventional fixed based NWS and FAA radars also captured remarkably high velocities and signatures. Below is the Terminal Doppler Weather Radar from Oklahoma City (TDWR). 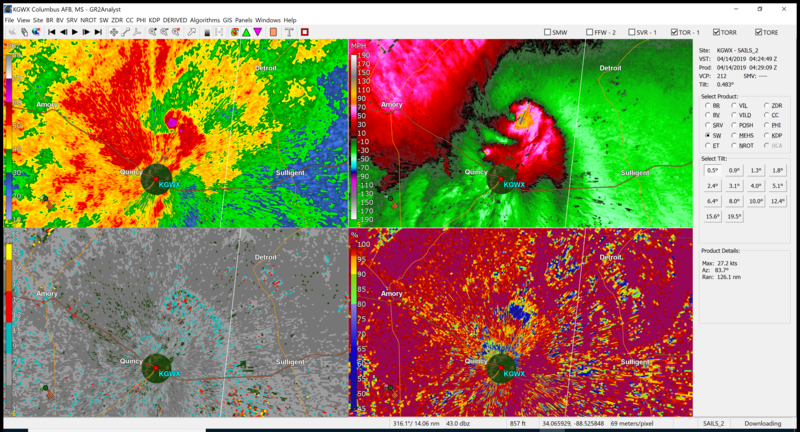 A C-Band Radar with a high resolution receiver (250 meter resolution data displayed) and it appears to capture an apparent reflectivity minimum in the center of the tornado at the *exact* same time that the RaxPol indicated the same feature in the tornado. This is quite remarkable considering the distance from the radar is 26 miles. This reflectivity minimum is likely caused by descending air within the tornado and centrifuging of debris and precipitation in this case. This is the RaxPol image from the exact same time as the TDWR image above. NWS KTLX Radar indicating maximum winds of 224 mph. 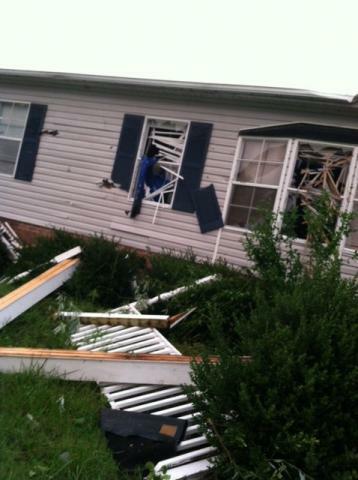 Tornado wind speed as it relates to force and damage potential: A case for an expansion of the EF scale? With mobile Doppler radar units that have become available in the past 20 years that have extremely high resolution, we have been able to discover tornadic wind speeds in a few of the sampled tornadoes that have approached or in one case exceeded 300 mph. The recent El Reno tornado on May 31st, 2013 was another example of one of these. Since the force of the wind does not grow linearly, rather it is squared (wind speed^2), these extreme wind speeds over 200 mph can cause unbelievable destruction. Since the kinetic energy is in the same arena as a small nuclear bomb, should one of these ”Super Twisters” hit a densely populated urban environment the destruction would be exponential compared to a lower category tornado. I created a graph to try to visually demonstrate the energy release or damage potential of the 2013 El Reno tornado as compared to just a few other recent tornadoes that have had good NWS storm surveys and tornadoes that had mobile Doppler radar measurements. 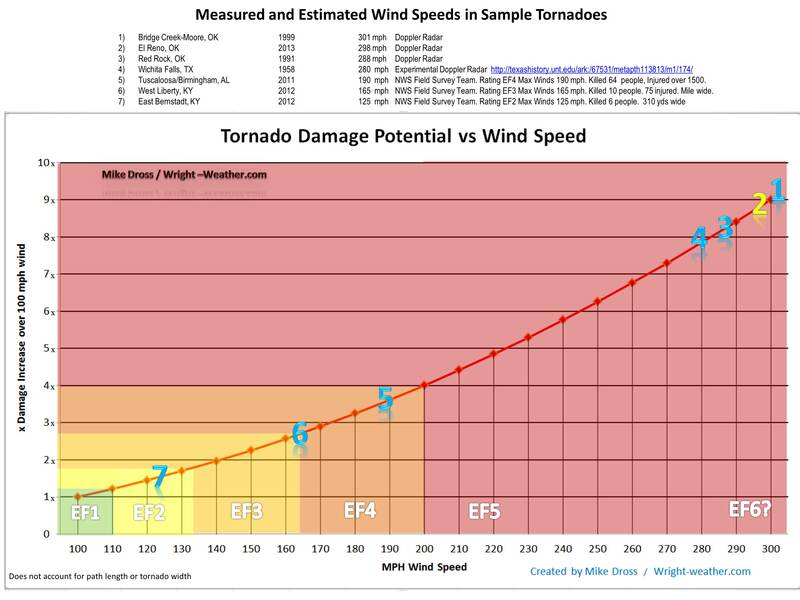 There is a cluster of Super Tornadoes in the upper right hand portion of the graph that illustrates how much more destruction they can create than an EF3 or EF4 tornado if they encounter buildings, cars or people. I think it also illustrates that there is a huge range in the EF5 scale. 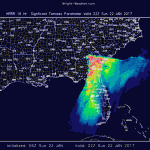 Maybe now that we have entered the era of reliable remote sensing and we know there are tornadoes with wind speeds near or even above 300mph and the energy release is so much greater than a 201 mph EF5 tornado, the idea should be at least entertained about adding an additional(s) EF categorie(s) to account for these rare, but extremely violent tornadoes given the their potential destruction and design limits required to survive them. An anomalously strong late spring upper level trough will develop along the Eastern U.S. Coast by Friday. Two shortwaves, one ejecting out of the southern stream over California, will at least partially phase with a second shortwave that drops southward into the Great Lakes on Thursday. These will combine to strengthen a surface low that will traverse from Iowa eastward to the New Jersey Coast. 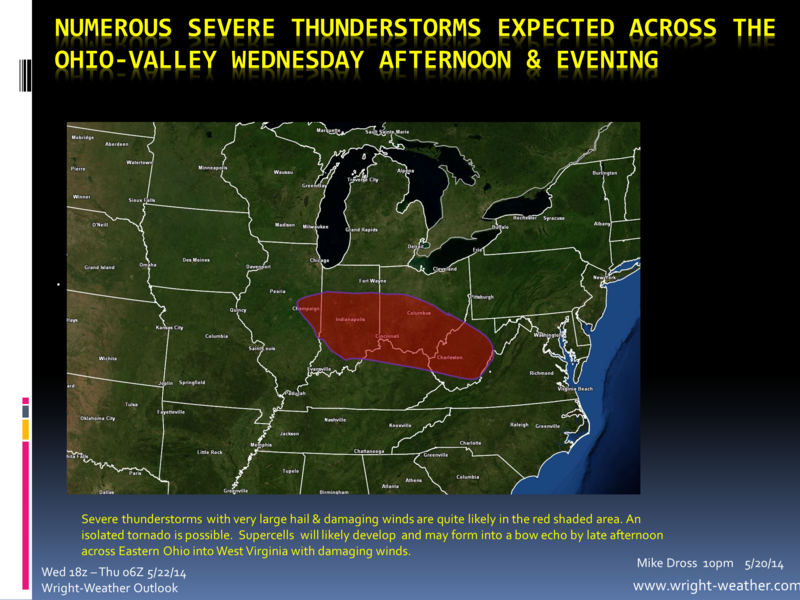 A two-day event is expected as severe convection will likely generate near the surface low Wednesday afternoon across Illinois and Indiana where the best forcing will exist, however further east across Ohio and West Virginia additional severe storms may develop with the aid of warm air advection and a mid level wind max in the northwest flow, during the afternoon. If discrete convection develops across Ohio/Western West Virginia on Wednesday afternoon there could be supercells and possibly strong tornadoes, given the favorable shear and other parameters. This is well ahead of the main forcing of the the surface low back to the west. Intense convection is expected to develop across Illinois and Indiana and track eastward during the overnight hours. As the surface low deepens, warm air advection will continue to help destabilize the atmosphere near the warm front which is likely to be near Northern Ohio into Western Pennsylvania . A greater risk of significant tornadoes exist along this boundary. Just north of the warm front elevated convection may produce large hail and damaging winds. Additional storms may develop further southward into Southern Missouri, Kentucky and Tennessee. As the upper level shortwaves begin to phase, per the NAM. The surface low is expected to slow somewhat and should allow for some destabilzation across the eastern portion of Virginia, Maryland, Pennsylvania, New Jersey during the afternoon. Wind fields will support supercells and possible tornadoes from Central Pennsylvania to New Jersey southward into the Carolinas . The best parameters for significant tornadoes on Thursday will exist near the warm front across Pennsylvania, Maryland, Delaware & into New Jersey. *All of this is highly dependent on surface heating and interaction with prior convective outflow boundaries, none of which the models can properly resolve at this time range. Below are some of the products used to create the outlook. NAM Forecast Sounding for Columbus, OH Wednseday Evening. If convection can initiate and overcome the convective inhibition across eastern Ohio Wednesday afternoon, the environmental conditions are favorable for discrete supercells and tornadoes. NAM Sounding would support severe storms and possible tornadoes. 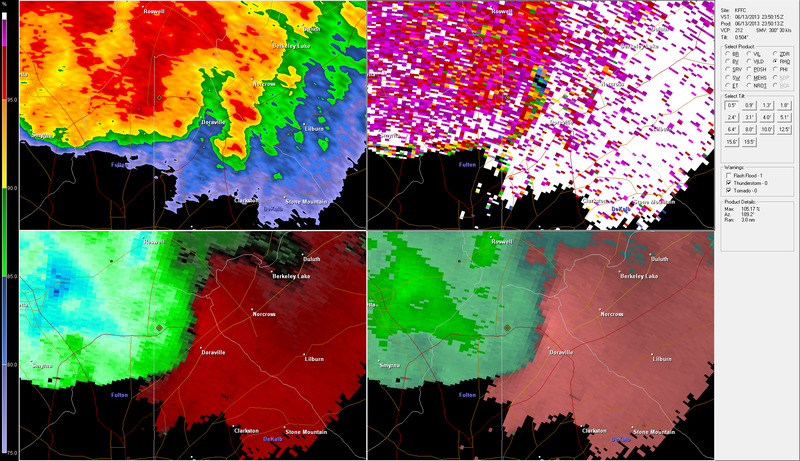 Updated: ATL Tornado on 88D? 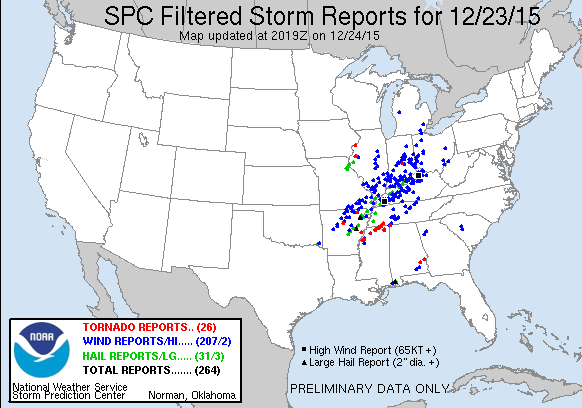 Did the 88D at FFC capture a Tornado ? Dual Pole data may have picked up some debris. Survey may tell later today. Here is a screen shot I took last night while the event was unfolding. The velocity data was not very compelling, but in the previous 3 volume scans there were much better indications of a circulation. Update: I pulled the archive data from last night. Here are previous volume scans. 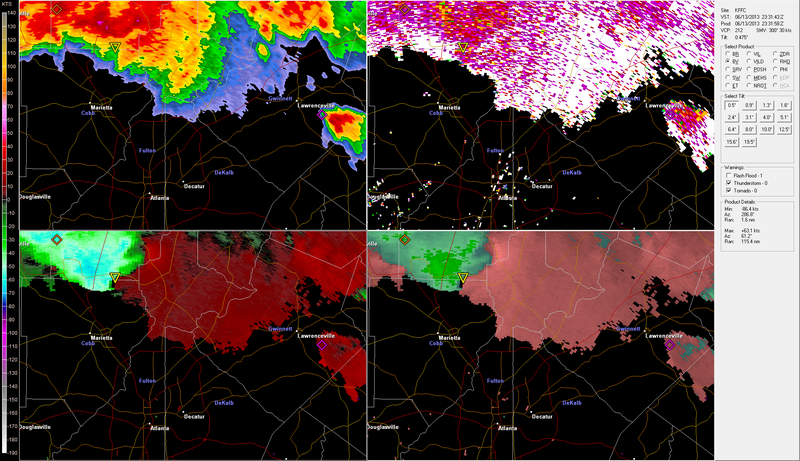 You can see the progression of the development of the CC min & other radar data. 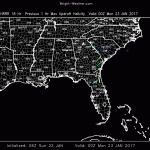 An apparent brief touch down of a tornado in Central North Carolina yesterday evening was detected by the Raleigh, NC WSR-88D Radar. The RDA was fairly close to the storm with the 0.5 degree beam altitude only around 1390 feet. 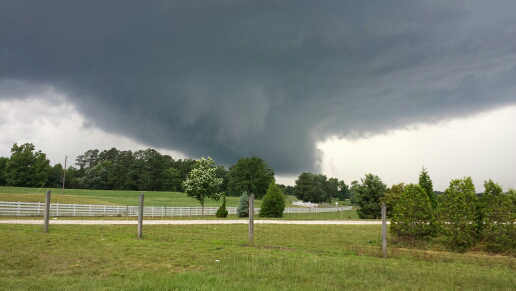 While the NWS survey has not yet been completed, it appears this will very likely be an EF0 or EF1 tornado, based on the damage reported, photos and radar data. The 22:31:59Z volume scan had a small, but defined TVS with gate to gate shear of ~81kts (+57/-24) and a well defined hook echo. It also developed a significant correlation coefficient minimum which was co-located with a reflectivity maximum in the hook where the TVS was also centered. All of this convinced me, that there was indeed a tornado on the ground and in progress. I quickly put together a “tweet” and sent it out at 22:36Z indicating that we now had a tornado on the ground. 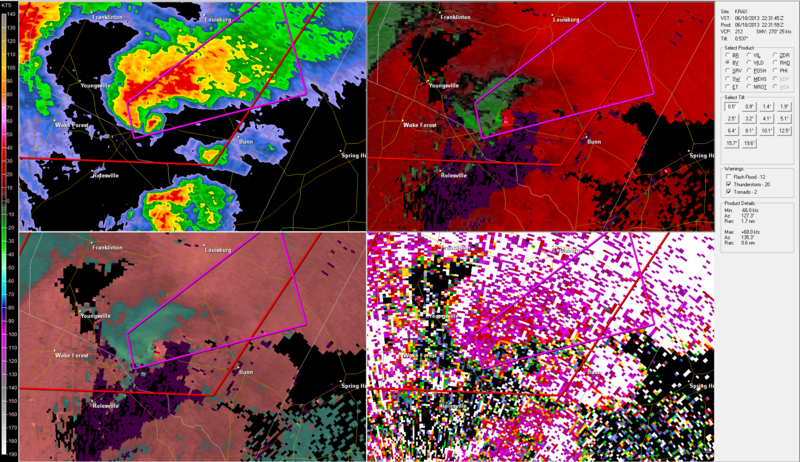 I also submitted something to the effect, on RAH NWSChat, about a possible debris ball developing on radar. 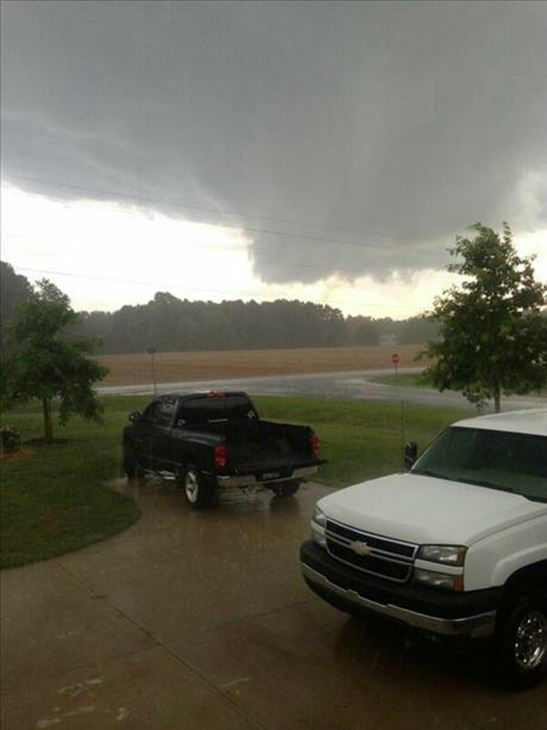 Shortly there after we started receiving verification of damage and sightings of the tornado. 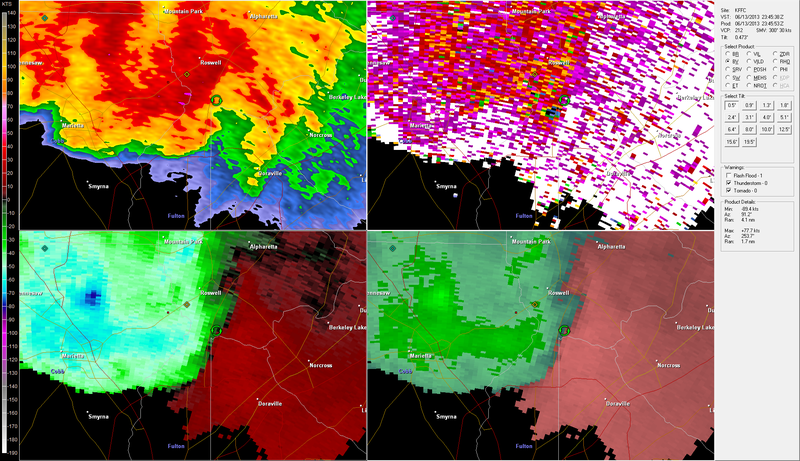 This is another example of how useful the Dual Polarization data can be when looking for Tornado Debris Signatures. Even for locating relatively “weak” tornadoes. Looking at the dual polarization data, it appears the “debris” was lofted to an altitude of around 2600 feet. My thinking is that much of this “debris” is likely tree leaves & foliage from the wooded areas where the tornado crossed, as well as, some other materials. 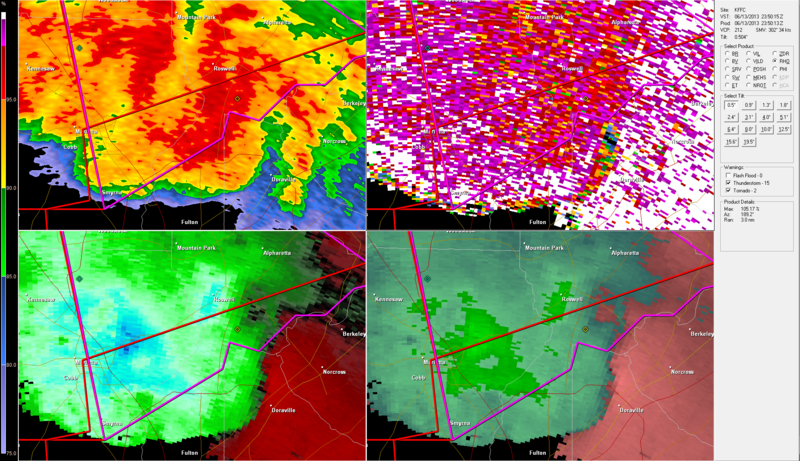 Next Volume Scan shows "Debris Ball" with reflectivity maxium and correlation coefficient minimum, but velocity couplet weakening indicating tornado dissipating. 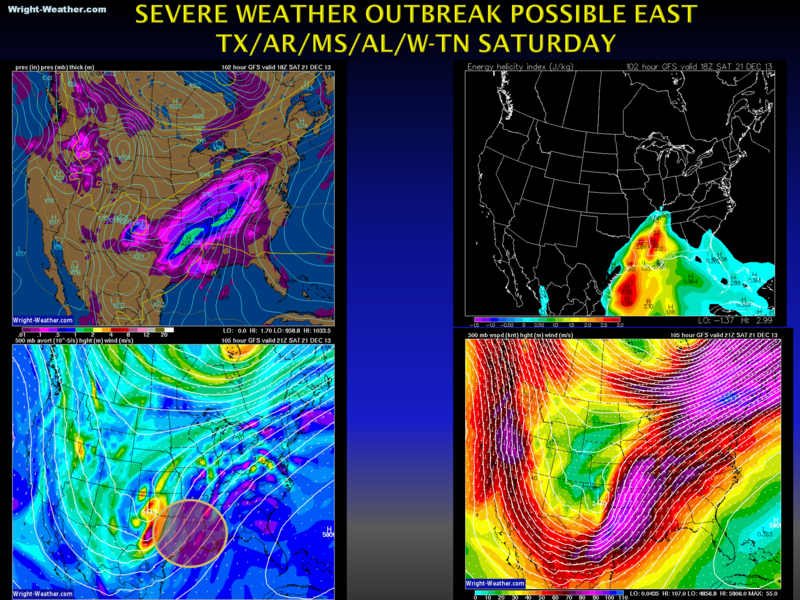 Quite a bit of uncertainty, but the latest data suggest the potential for severe thunderstorms and possible tornadoes across Eastern Texas and the Deep South Saturday as a strong, negatively tilted, shortwave ejects across Texas. Stay tuned over the next couple of days if you live in this area. After reviewing the 00Z model guidance, it appears that the instability will be somewhat limited on Saturday, due to clouds and marginal lapse rates. Severe thunderstorms with damaging winds are likely to develop across East Texas during the morning and spread quickly eastward during the day. 0-6Km shear vectors are large and 0-1km helicity values will be locally high, so some low-top supercells are likely, including the risk of a few tornadoes. But given the expected limited instability, SFC CAPE <1000, a widespread outbreak of tornadic supercells seems unlikely. The threat of damaging winds is high however, as the low level jet increase to over 70kts during morning and early afternoon. Freezing rain will moving into the populated region of New Jersey and New York City around midnight (2/5/14) and will persist until around noon Wednesday. Temperatures in the New York city metro area are expected to remain near or slightly below freezing the duration of the event. Just northwest and west of the downtown area, slightly colder surface temperatures are likely. Total precipitation amounts of 1.00-1.25″ is expected. A significant amount of drip loss will occur due to the heavy precipitation rate and the small air temperature delta to freezing point. Where temperatures are likely closer to 29 or 30 degrees just west and northwest of the city, ice accretion amounts of 1/4″ to as much as 1/2″ are possible and could lead to a significant amount of power outages, if ice accretion amounts surpass 1/3″. Here is an example. 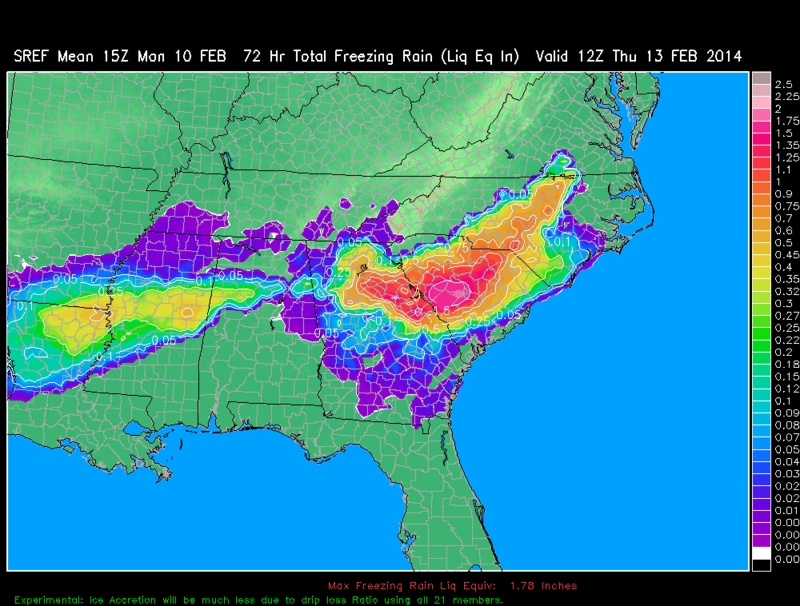 Freezing Rain Accumulation across the Southeast. 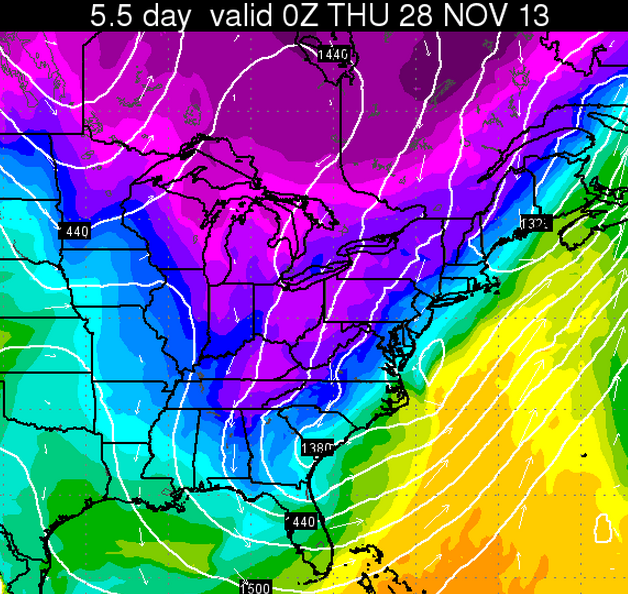 Major Winter Storm To Impact Southeast Then East Coast. 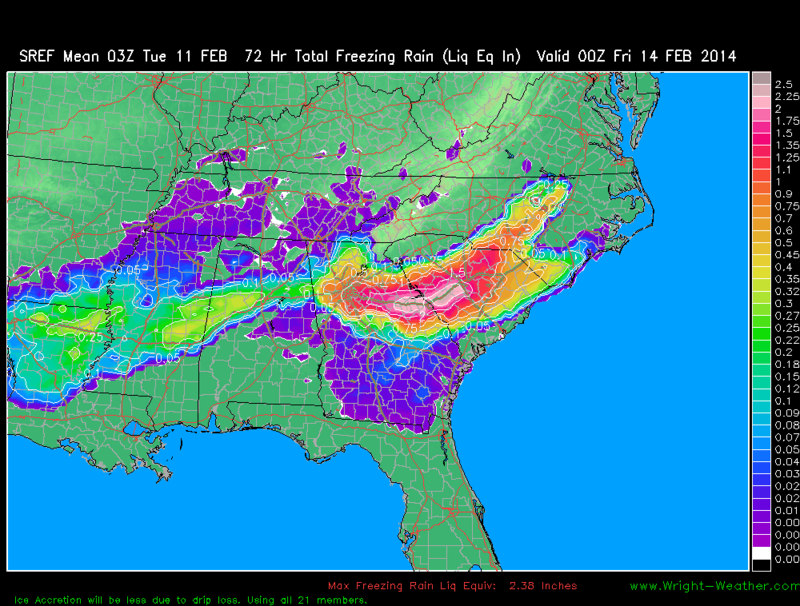 A zone of of prolonged freezing rain will extended the I-20 corridor from Atlanta to Augusta to Columbia, SC. 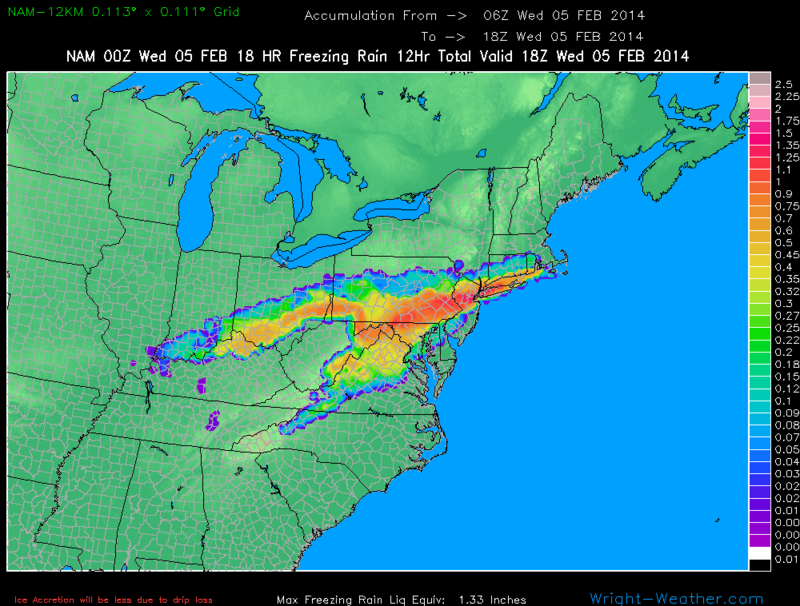 Model freezing rain liquid equivalent totals in this area exceed 2 inches. While drip loss will be relatively high with accretion efficiencies likely only being in the 30-40% range due to the high precipitation rates and the temperatures likely remaining close to the freezing point, this still yields radial ice accretion amounts of .50-75″ which would cause widespread electrical distribution disruptions and tree damage. 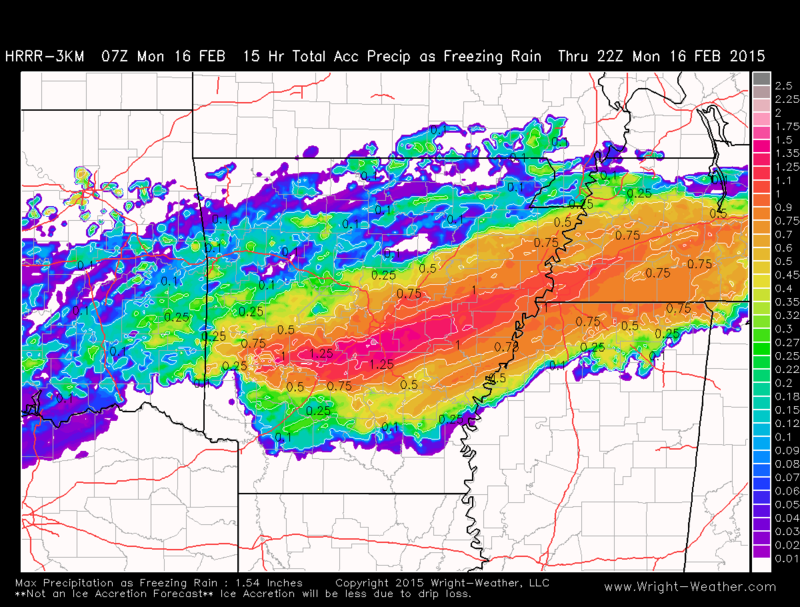 Here are the latest Freezing Rain Graphics. 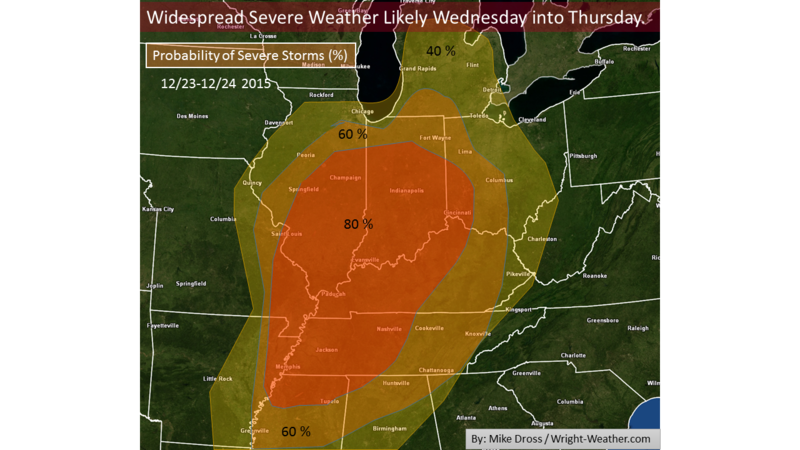 Outbreak of Severe Storms Including Tornadoes – Thursday Afternoon Into Friday Morning. An upper level shortwave will move through the Mid-Atlantic region Friday evening. Ahead of this shortwave, conditions will for a short period of time, become favorable for severe weather across Central and Eastern portions of the Carolinas and Virginia. Thunderstorms will likely develop by mid day across the central portions of the region and move eastward and intensify under a strong mid-level flow. 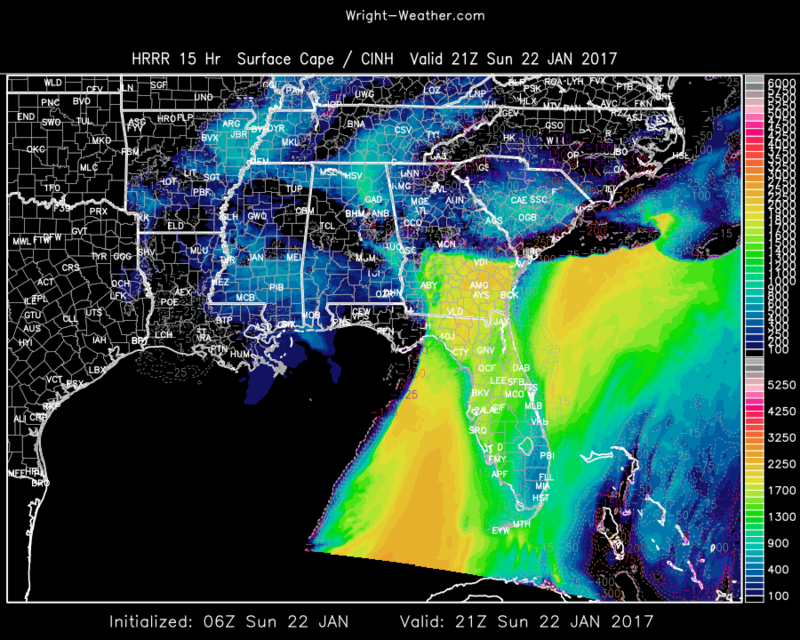 Moderate helicity and bulk-shear values along with surface CAPE in excess of 1500 will support the potential for supercell development. 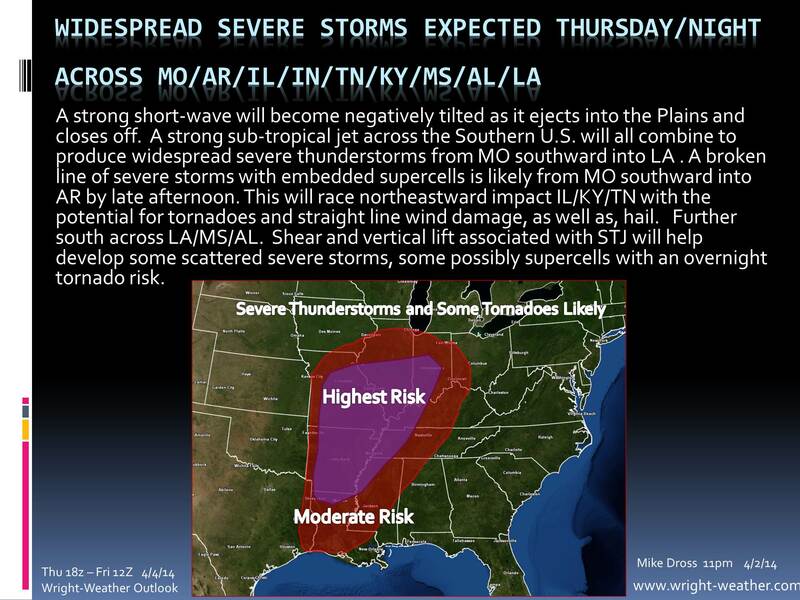 Low LCL levels will also increase the risk of tornadoes in the strongest supercells. Trends in mid-level wind strength and instability should be monitored for an increase in the severe weather risk assessment. NCEP has recently upgraded the WRF-ARW/NMM Hires windows for the Eastern U.S. to a CONUS ARW and NMMB ~4km WRF runs. They are run at 00Z and 12z and produce hourly output out to 48 hours at roughly 5km. We are in the process of making the necessary changes within our software and systems to accommodate the increase in files sizes and processing requirements to handle the larger domains. We should have these new data sets available and finalized later this week. Look for them where the old WRF-ARW/WRF-NMM EAST model pages were located. Here is the NCEP technical bulletin describing all the changes to the model & physics in the upgrade. Added the ECMWF 500mb winds to the ECMWF regular resolution graphics. These can be useful in projecting the mid-level winds that can aid in organized severe thunderstorm development. These can be found in the drop down menu, as well as, the individual time frames. These are available for the Northern Hemisphere at the moment, but will include all sectors soon. A spring like cold front will move through the Mid-West and combine favorable wind shear with strong instability Saturday into Sunday afternoon and will likely produce widespread severe thunderstorms with large hail, damaging winds with the possibility of a few tornadoes. An unseasonably strong upper level short wave will drop southward into the Ohio-Valley on Sunday and will increase the mid and upper level flow across the region. Favorable instability, bulk shear & moderate helicity will support organized severe thunderstorms beginning on Saturday across IA/MO/IL/IN. 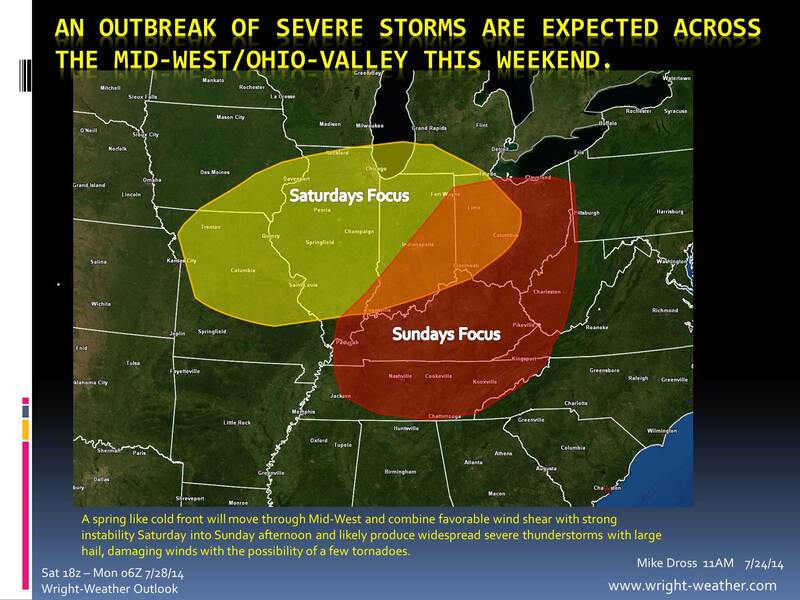 The threat shifts eastward on Sunday into IN/OH/KY/TN/WV. A tornado threat exist along the quasi-stationary front across northern IN/OH and a conditional threat also exist within the low level theta-e advection zone across eastern Ohio/Kentucky & West Virgina where 0-1KM EHI’s & 0-1Km bulk shear are highest. Should be an active 48 hour period. Additional severe storms are likely into Monday across the Northeast and Mid-Atlantic. 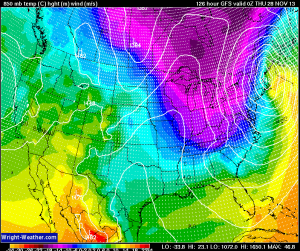 The GFS model will be upgraded tomorrow, 1/14/15. It is under going a major upgrade. The below PowerPoint link will explain in detail the model physics and initialization changes that have been made, as well as, the effect on model performance. This is a major change to the model and there will likely be new biases and features that we didn’t see in the old GFS due to the higher model resolution. The model is now running at about 13km (near the equator). 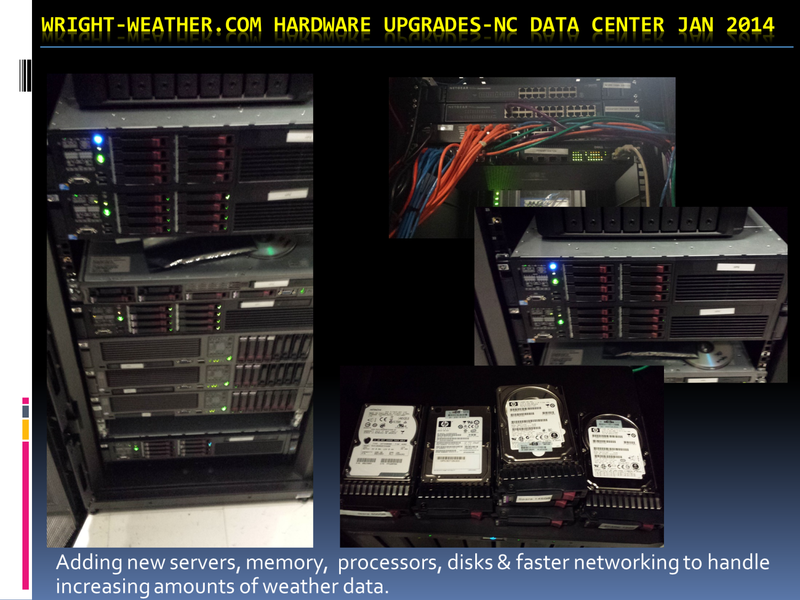 We now have several HP DL380 server’s clustered to handle the higher resolution GFS, as well as, HRRR data. We will have the GFS data in 2 different resolutions. The standard 0.5 degree which have been displaying for years now and soon we will have surface and other 2D fields 0.25 degree. Look for the higher resolution data in the coming days. The new GFS based model data at 0.5 degrees will begin tomorrow (01/14/15) however, unless NCEP decides to delay the implementation. The upgraded GFS model went live today. Over the next several days we will be tuning our systems to optimize how we process the new GFS output. The are a number of new variables and higher resolution fields available. We want to make the best use of our resources. You may notice some slight changes in the model graphics or timing of the products for a few days as we make changes in how we process this data. We are currently working hard to bring on much higher resolution GFS products on our new Linux servers that we just setup. We hope to have the new GFS products available soon for our customers. A potent mix of thermodynamic and kinetic forces will become colocated across the lower Ohio and Tennessee Valleys on Saturday to create conditions favorable for destructive, powerful supercells and potentially violent tornadoes. A very powerful jet stream will work across this very unstable airmass with winds at the 200mb level in excess of 150 mph, as depicted by the NWP guidance. It is very rare to have winds of this strength/a jet stream/ directly across the convective layer and will add significantly deep layer shear aiding in ageostrophic imbalances helping to promote mesoscale ascent. Typically, the mid latitude jet is well removed of the warm/buoyant air mass and rarely directly overlaps. This could be one of the more unique events and we need to watch this very closely given the kinetic forcing in the upper levels of the troposphere in this upcoming event. Guidance at this time suggests an early round of showers and non-severe thunderstorms will move through the Mid-South during the early morning hours, followed by partial mid-day clearing allowing for solar insolation and destabilization in the Ohio, Tennessee-Valleys. How these lead convective elements ultimately play out will likely define mesoscale outflow boundaries that will determine where supercells and tornadoes develop later in the day. Convection with supercells and the risk for strong to violent tornadoes will develop in association with this powerful jet/shortwave from the Ohio-Valley southward into Mississippi/Alabama and spread eastward. The area at highest risk of tornadoes appears to me from Southern Illinois, Southern Indiana, across Kentucky, Tennessee southward into Central Mississippi and Alabama. The strongest tornadoes would likely occur in Southern Illinois, Southern Indiana, Kentucky and Tennessee closest to the best 0-1km shear maximum, 0-1km SRH and lowest LCL’s. The tornado risk may spread into western Georgia. Forecasters and those living in these regions should closely monitor developments and SPC outlooks over the next few days. The SREF (Short Term Ensemble Forecast) system was recently upgraded to 26 members. This caused an issue with some of the SREF products not being generated. These problems have been resolved and all SREF products are again available. Here is the link to the SREF forecast products. 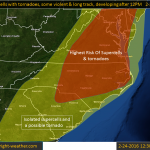 Conditions favorable for supercells and tornadoes this afternoon will develop across Central and Eastern North Carolina into Western Virginia. Extremely favorable shear and strong mid-level winds will combine with afternoon heating, to allow destabilization to occur at the time of frontal passage. A broken line of supercells should form by mid to late afternoon across Central North Carolina northward into Western Virginia, These cells will move rapidly northeastward beneath a 100+ knt mid-level jet. The cells will be capable of producing violent tornadoes as they continue into the evening hours. Straight line winds of 75 mph are also possible in bowing segments or in rear flank down drafts. There will be a considerable amount of dry air aloft which will limit the coverage of storms, but will aid the formation of the tornadoes, combined with a low lcl. 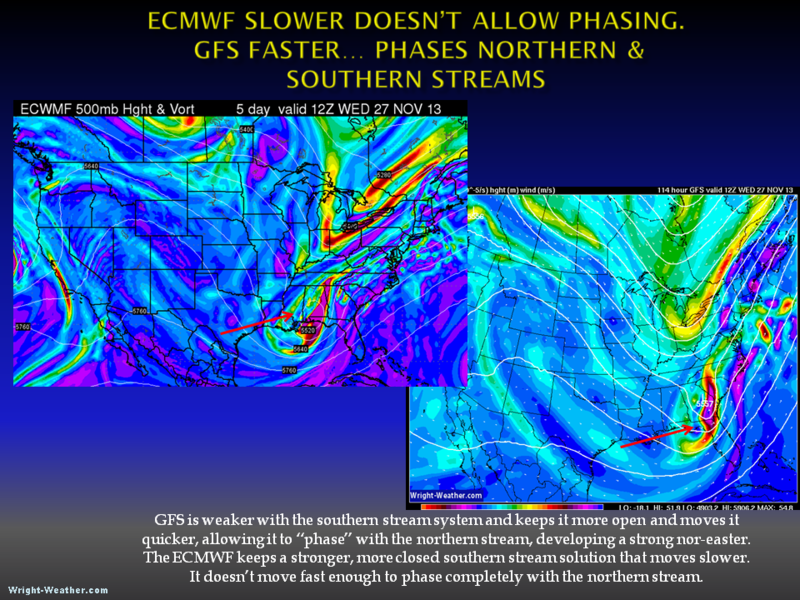 A New GFS Developmental Model Is Being Tested in Parallel at NCEP. Should provide better forecasts this year. NCEP has been running a new version of the GFS for a number of weeks in parallel. Some important changes ahead with the new version, which will likely go into production in May. The current GFS uses an initialization method called 3DVar, which is an older method of initialization and essentially takes a snapshot of the atmosphere when the model is started. The new version being tested and will likely be put into production this spring will utilize a more modern method of initialization called 4D-Ensemble-Variation. It is basically a separate model that runs constantly tracking in real-time, changes in the atmosphere so when the GFS run starts it has a much better initialization, in theory. Verification numbers support 4DEnsVar being a much better solution. The ECMWF has used 4DEnsVar for quite sometime. The CMC Global model and the UKMET and even the Navy NAVGEM have been using a version of the 4DVar for a while now. This will bring the GFS up to par with the other global models in terms of initialization schemes. The 4Dvar and 4DEnsVar are quite computationally expensive and up until recently NCEP didn’t have the computing resources to implement 4DEnsVar. 4DEnsVar is somewhat less computationally expensive, while providing most of the benefits of traditional 4Dvar. More information about the ongoing GFS parallel testing can be found from this technical note from NCEP released today, with many links to various NCEP sites that have output and statistics from the new GFS developmental model. The GFS Spring 2016 upgrade was completed today as of 12Z. 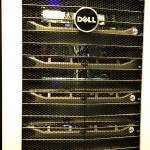 This was the long awaited upgrade that included the 4DVar inclusion. For more details on the all the changes to the GFS model see the NCEP technical attachment. In short there should be some improvement in the model performance, but overall there will not be a significant leap in model accuracy with this one upgrade. A fix to an internal network error has corrected a problem with the GFS Tropical Sector. It is now working again on the 12Z 5/25/2016 run. NCEP has significantly upgraded the HWRF this year in time for the heart of the 2016 tropical season. I have updated the code to process the new higher resolution HWRF data which is double the resolution of the older model output. Invest 97L is now available along with other systems being monitored in the Atlantic and Pacific Oceans. 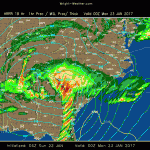 Check the Tropical Products menu on the home page, under “Site Navigation” for the name of the tropical system with word HWRF appended to it. Upgraded the processors and software on the radar server to handle NEXRAD 2 minute and TDWR 1 minute frequency, lowest level reflectivity and velocity scans from all 160+ sites. This is a significant temporal increase in resolution from the 6 minute updates we originally received from the NEXRAD and TDWR radars. The new imagery is now available for all sites. 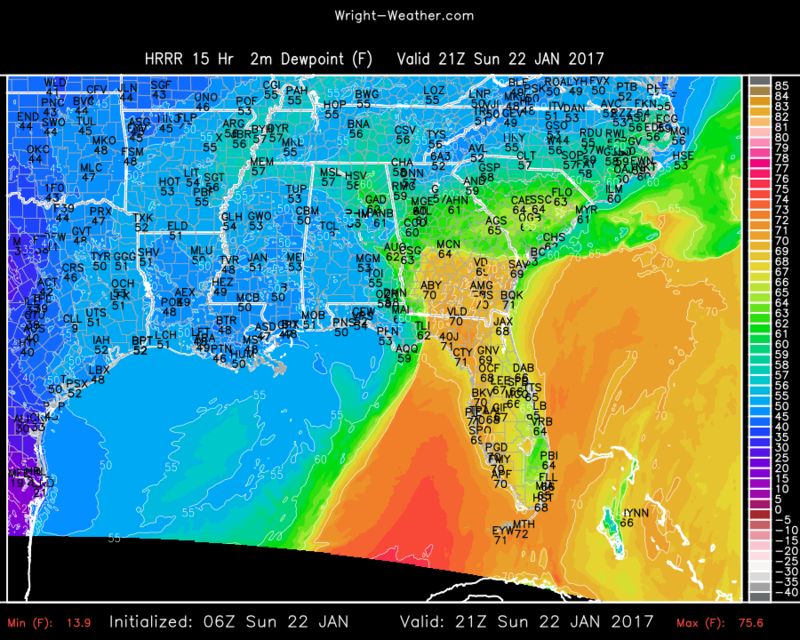 The Heat Index and Relative Humidity were added to the HRRR model. Also the HRRR model is scheduled for an upgrade later this month. A separate announcement will be made when the upgrade is completed. The real-time Lightning data feed, which has been having communications issues recently has been fixed. All real-time lightning data is flowing and expect no additional real-time lightning strike data issues. Real Time Lightning Plots can be found under the “Observed’ menu item and under Single Site Radar and Mosaic Radar menus. The HRRR and RAP Models were both upgraded today. Many changes to the internal physics where introduced which should improve the forecast accuracy of both models. More details can be found here in a technical notice from NCEP. 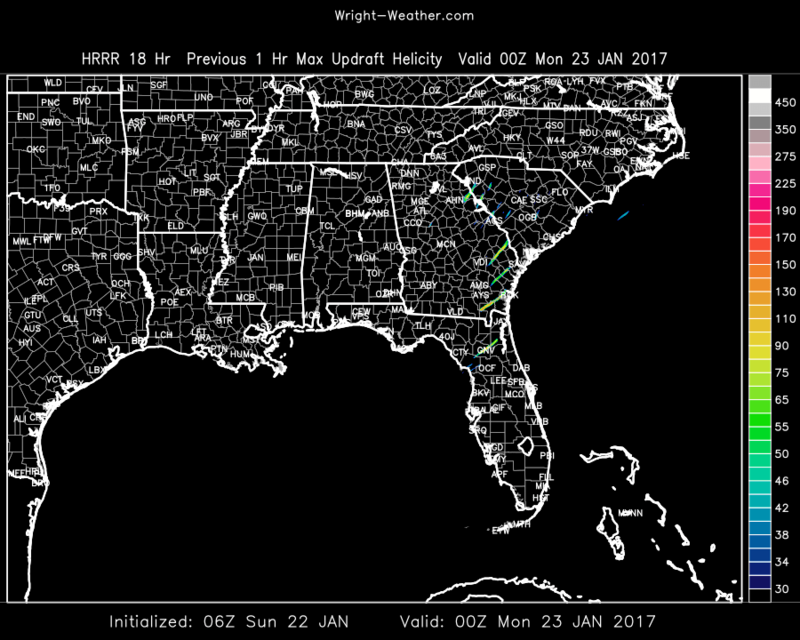 The HRRR model was increased to 18 hours on the Wright-Weather site. The RAP model will be increased to 21 hours from 18 hours later this week. An issue with the GFDL Graphic Generation was resovled. All the GFDL Hurricane Model Graphics area now being generated as of 12Z. GOES East Simulated IR Imagery was added to the HRRR and NAM4m. Right now it using the AVN IR Color curve. May improve it by going to the NCDC color curve. If you have any feedback or questions let me know. Added Lifted Index to the DGEX. The DGEX runs from 84-192 hours and is the GFS downscaled NAM extensions. The output is 12km. Monday morning thunderstorms are expected to develop across Eastern Texas northward into Arkansas and Missouri, as a very strong upper level short wave rotates around a deepening full latitude trough. These storms will expand rapidly northeastward during the day as line or broken line across the Deep South and spread into the Tennessee and Ohio-Valleys during the evening into the overnight hours. Damaging convective wind gusts are quite possible across a large area from the Gulf Coast region into Lower Michigan. Model guidance has converged on a solution with extremely strong winds at all levels of the atmosphere, combined with very strong upward vertical forcing across the Deep South northward into the Ohio Valley. Marginal instability, the limiting factor, will likely be overcome by the extremely strong forcing associated with negatively tilted shortwave with 80+knt 850mb/ 110+knt 500mb/ 175knt 200mb jets. A widespread wind damage event is becoming increasing likely and may extend from the Deep South northward through the Ohio Valley into Monday night. Tornadoes are also possible give the extreme low level wind shear, helicity and forcing. The severe weather threat is likely to continue across the Southeast on Tuesday. Additional model data will need to be evaluated closely for the Monday/Tuesday time frame. 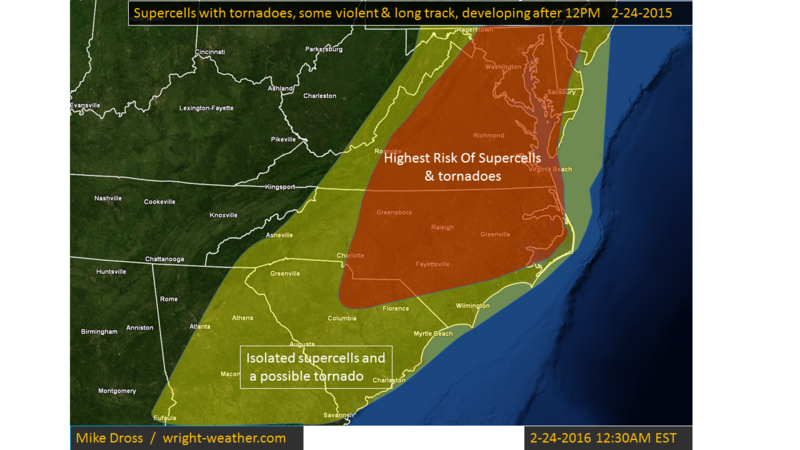 Any significant increase/decrease in instability will change the risk of this outlook. Some associated graphics from the 00Z/26 NAM indicating the kinematic & thermal forcing expected with this event. Added Wind Gusts to WRF-ARW/NMM CONUS. Also as a side note. NCEP is planning to upgrade the NAM model in January 2017 and the NAM CONUS spatial resolution is going to improve to 3km from 4km. Also there will be physics changes that will result in a small improvement in the model. We wwill post an update when this upgrade is completed. In addition to higher spatial resolution, going from 4km to now 3km, the parallel version is now available hourly to 60 hours. The current operational version only provides hourly data to 36 hours. The parallel data will be made available until at least February 1st when the NAM v4 is expected to become the operational NAM model. If in testing problems arise, it may get delayed, going operational, extending the parallel testing period. 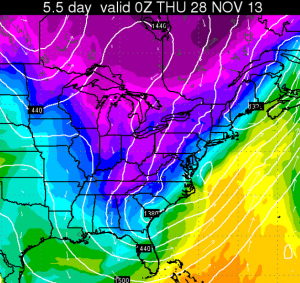 Here is the link to the parallel NAM 3km CONUS model. 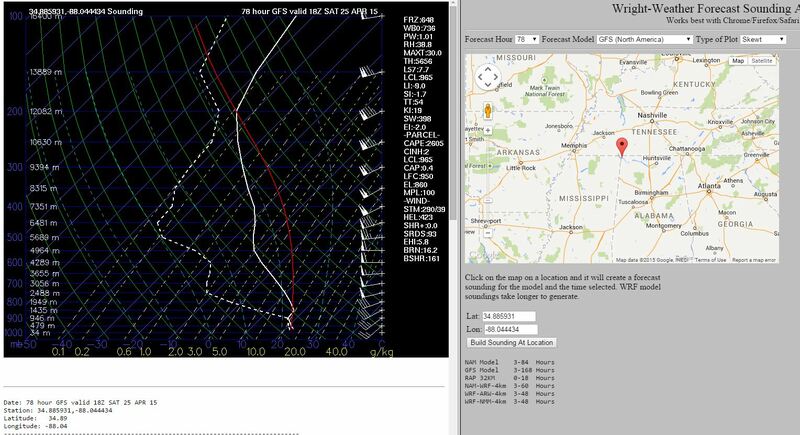 The next operational version of the GFS model v14.0 is currently in evaluation and available on Wright-Weather.com. Here is the link. It updates at 00/06/12/18Z and comes out a couple hours later than the Operational GFS. Introduction of Near-Surface Sea Temperature (NSST) describing near surface oceanic vertical temperature structure due to diurnal warming and sub-layer cooling physical processes. SST, satellite data assimilation and weather forecasting will be improved by using advanced GSI data assimilation techniques to analyze SST together with atmospheric analysis variables. SST diurnal variability is resolved with the NSST model. Stability parameter constraint in the Monin-Obukov similarity theory to prevent land surface and atmosphere from fully decoupling leading to excessive cooling of 2m temperature during sunset. Modification of the roughness-length formulation in the surface layer. – Convection trigger condition to suppress the unrealistic summertime spotty precipitation over high mountains. Rayleigh damping applied to model layers above 2 hPa reduced by 50%. scheme changed from 800 hPa to 1000 hPa. Changes in the land surface and stability parameter should reduce a near surface wintertime cold bias, a rapid temperature drop during sunset and reduce a blockiness apparent in some near-surface fields. Some nighttime warm biases were introduced. Changes in convection should reduce a positive bias in light amounts of precipitation and unrealistic summertime spotty precipitation over high mountains and increase skill in forecasting precipitation. NSST is expected to improve tropical forecasts and may affect mid-latitude oceanic storms. Reducing Rayleigh damping improved wind and temperature forecast in the upper stratosphere. Applying the revised reference pressure reduced model computational noise in the upper atmosphere. An extremely strong upper level vort max will move into the Gulf and develop an unusually deep low pressure system across the Western Carolinas Sunday night. Conditions just ahead of the cold front, along/south of the warm front will become extremely favorable for supercells to develop as 0-1 km helicity will be well above 500 and 0-6km shear will be over 60kts. STP values are over 8. There is also an an enormous amount of atmospheric lift as the left front exit region of the 300mb jet moves across the area, which is causing the surface low to deepen so quickly. This is an extremely unusual system to bring this much instability and shear to an area this far south. Only once every decade or more does this region experience such extreme parameters. The potential exist for long track and violent tornadoes exist across North Florida into into Eastern South Carolina Sunday afternoon. I am attaching a few charts to illustrate the extreme nature of the tornadic environment today. Those forecasting in this area be mindful of the rare nature of the parameters involved this afternoon. The NAM (North American) model was upgraded this morning. There are many new updates to the model (see the NCEP TIN link for details), one of the important changes is with the NAM CONUS NEST. It was upgraded from the 4km to 3km horizontal resolution along with a number of physics changes. The NAM 3Km NEST has been available at Wright Weather for a couple of months running in parallel while NCEP evaluated its output. Here are the links to the NAM model. 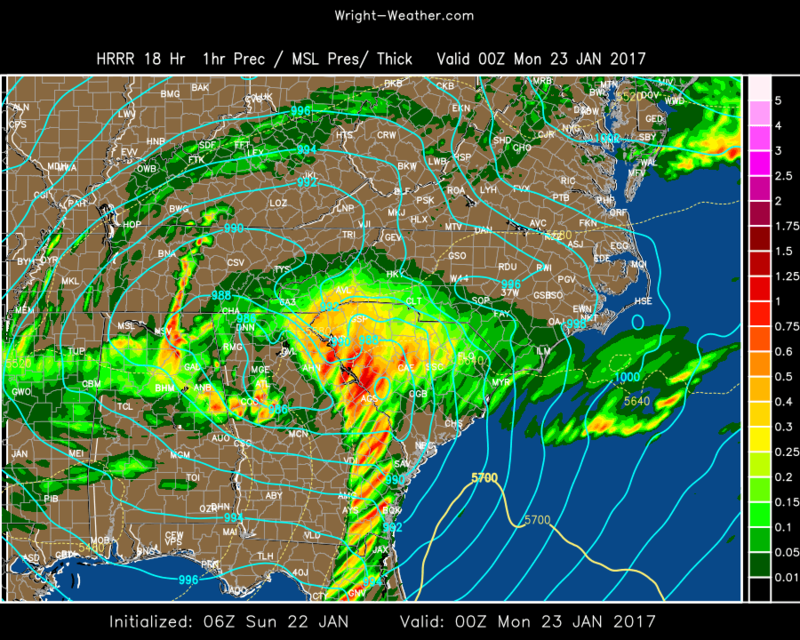 NAM 3km CONUS Nest (Classic) /w upper air products. Here is the NCEP TIN outlining some of the changes to the model.